Getting laws changed. Enacting new regulations. Starting a global movement for X, Y, or Z. These may be things you think of when you hear the word “advocacy,” and they are amazing efforts. But they are not the only ways to advocate. Not at all. There are many ways you can be an advocate, and you likely already are, even if you don’t realize it. Not every gesture of advocacy needs to be grand; in fact, sometimes the smallest of efforts may result in huge payoffs! When someone in your family has food-related health issues, home may not seem the ideal place to worry about advocacy. Many of us choose to have home be a “safe zone,” but even though you know the routine, there are always visitors who may not. My “little” guy has gotten in the habit of reminding people who come over to please wash their hands when they come in. This has been a rule in our house since before allergies were an issue (having studied and worked in the operating room in my prior life… I may or may not be a bit of a stickler for hand washing in general, no surgical scrubs necessary). This is just one way my child advocates for himself. Label reading is a life skill, but also a way to advocate. Make phone calls if a label isn’t clear. Send emails to get answers about anything in question before eating it. These are just a few home advocacy things you probably do on a daily basis, that you probably don’t even think about. See, you are already an advocacy rock star! There are many opportunities for you to be an advocate at local schools. For many people, this takes the form of education. We can go into classrooms and read books packed with allergy information to the kids. We can educate the teachers and staff about allergy and anaphylaxis recognition and management. Meetings with administrators and food services are another way to encourage new policies and procedures to keep kids safe and happy. We personally have been working with our district for several years and this year, they implemented a district-wide program which includes more education of staff, as well as the (dreaded) party guidelines. These things don’t happen overnight, so be ready for the long game, and know that every meeting you attend brings you that much closer to change. I have also heard many times that people are told “Our school doesn’t do 504/IHP for food allergies.” This may be true, but if your child needs a 504 or IHP, then you can help those coming after you by going for it! It may not always be easy, believe me, I know that. There are many amazing community members who have walked this path before you, and who can be tapped to help. We may not be lawyers, but we are parents who have done it and gotten through to the other side. I think I speak for many of us when I say that we want to share our experiences with those who are coming up to these challenges now. We want our trials to help educate others on how to get what is needed for our kids. Another form of advocacy is in your local community. Lately, I have seen a lot of amazing allergy-friendly Halloween events happening around the country. They are an amazing way to advocate in your community! Talk to your local zoo, libraries, community centers, and churches. Not about forcing them to change what they are doing (which can be off-putting), but suggesting simple ways to make events inclusive for people with food-related issues. Many times when I speak to these kinds of places about allergies, they get a look on their face that I’ve come to recognize, then tell me “We never even thought of that!” Most places WANT to be inclusive and make events safe for everyone, but many don’t even know there’s an issue until someone brings it to their attention. You can be the one to make those changes! I have spoken to our local grocery store about placement of certain products. For example, moving the gluten-free flour away from the regular bags, which we have all seen split open, spilling their contents onto the shelving. Another form of advocacy that can directly impact your local area. 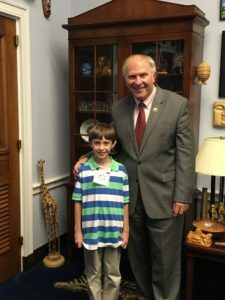 TealKid and I had the opportunity to lobby at the national level with the Allergy and Asthma Network ( http://www.allergyasthmanetwork.org). You probably already know that from a food allergy parent’s point of view, traveling can itself be overwhelming. I started about 6-8 weeks in advance. I planned our route. I checked the websites of restaurants near the hotel for allergy ratings. I emailed the hotel (who were amazing, by the way!) I downloaded apps to show me where the nearest ER was (never hurts to be prepared). I’m tired now just from thinking about the planning, but when we got there, we had the most amazing experience. We spoke to our representatives about issues that we face daily, and how they can help make changes that can help others facing similar challenges. 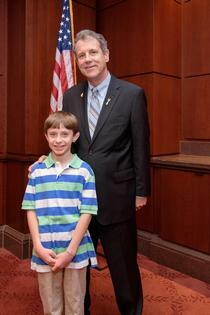 We both loved our time in DC getting TealKid’s story out and trying to help make changes for the community. Remember, advocacy is very different from complaining. Go in with the issues in mind, but more importantly, have suggestions for solutions. Each and every positive thing you do for you or your loved one is helping make the world a better place for all of those who come after you. Each and every day, we advocate. Every time we have to give a friendly “reminder” to grab epinephrine, when we read labels, when we call the restaurant before we head out to be sure we are making good choices, we are being advocates. 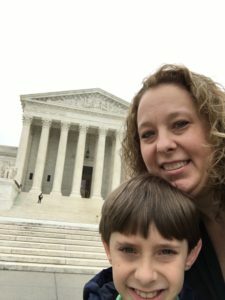 There are so many large issues out there that are being tackled by huge government think tanks and other organizations, that I think sometimes we, the “little guy,” get pretty discouraged in what we are doing to advocate for ourselves or our families. I am giving you each a huge teal thumbs up for all of these things you are doing to advocate. See? You didn’t think you were making a difference, but you really are! TealKid loves to travel and had an amazing time in Washington, DC.